PreSonus LIVE: Breaking Barriers airs May 23, 2017. We’re gearing up for our next PreSonus LIVE! We’re going LIVE on Facebook and YouTube May 23 at 10 am CST! Get your questions ready for us! VP of Sales, Rick Naqvi and QA Head Honcho Dominic Bazile, will be hosting and taking your questions. 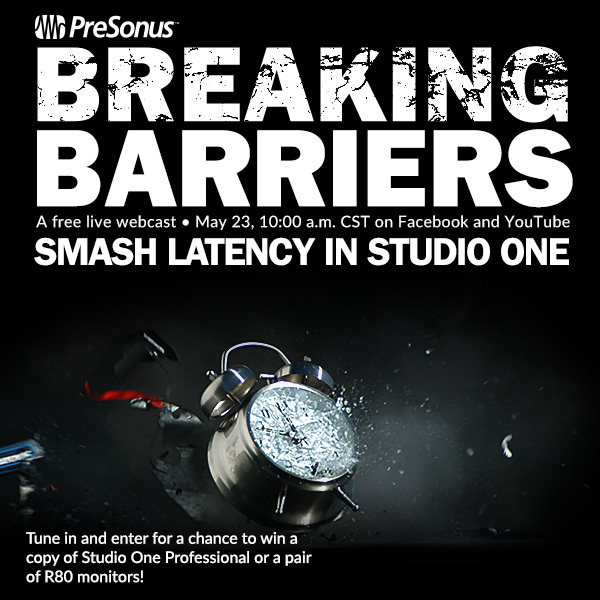 This broadcast is all about speed–smashing latency into the ground and leaving it in the dust. And we have a Studio One secret to share–don’t worry, Tuesday is only a few days away. Of course there will be prizes. RAD PRIZES. Don’t miss out. Watch us on YouTube here! very robust(yet simple enough to pull off this nuts stuff) and not too many distractions when creating. — some(most of the ones I have tried) of the PreSonus plug ins run more efficiently(latency and CPU) then waves and for example the iZotope Neutrino (promoted add on for individual tracks… spectral shaping technology), some times the presets need a little more tweak(no tweet)but if I monitor audio or use midi I use the PreSonus plug ins. I can understand why cubase or PreSonus plug ins are not swappable in other Daws but I would like to run some of the PreSonus plug ins in notion at some point. wonder whats the barrier(the new fast connection I quess. I have a question for some . why the new usb instead of things like e sata ? is it a power thing? I have issues with USB 3 on my Mac Pro(2010) . just wondering I guess they will go into some of this later. No problem. I have no doubt you would. Look I’m a big PreSonus fan. But a simple yes or no would not have given anything away from the reveal. You will enjoy the Faderport 8. I love mine! Just make sure you unplug any other USB midi devices before trying to install it. Easy compromise. Just send me a pair of Monitors! 😀 My money’s going toward a Faderport 8!!. Sorry. I would answer the question were I allowed to. If they aren’t releasing whatever it’s about till Tuesday then how are they supposed to answer his question here? Everything isn’t a conspiracy. The show will be archived on both platforms after the broadcast. Regarding work hours, we have to be at work during work hours, too—which is when our staff is at our headquarters and able to broadcast the show. 4 days notice for a webcast in the middle of a work day? Fair question. Deserves an answer not a ploy to lure people into watching a sales pitch. You don’t have long to wait to find out!